You might know the man in white, but you probably don't know who his travelling companion is. As it seems she wants you to know who she is, I will do my part. A friend tipped me off earlier today to the website of Princess Alessandra Borghese -- universally known as "Ale." Together with the now-legendary Gloria von Thurn und Taxis, Ale forms the royal component of the court of B16's Vatican. As you can see, she's in, alright. (A real princess as opposed to a clerical one -- how refreshing!) 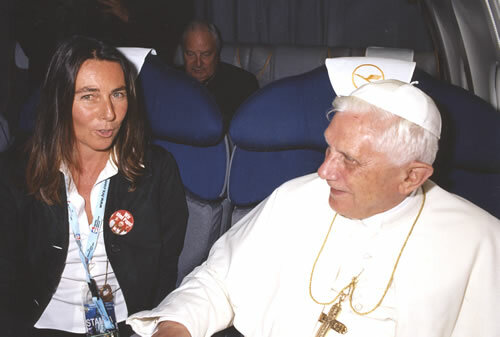 On that topic, while some American bishops (who shall remain nameless) were stamping their feet and throwing diva fits over their logistical arrangements in Cologne, la vera principessa had no such issues, including the perk of flying on the papal plane. And what a seat, eh? I know some of you would kill for that kind of placement.... Note Cardinal Sodano at ease in the back left. Veteran Loggiaheads will recall that the princesses -- Ale calls Gloria her "apostle" for bringing her back to the faith -- have been repeatedly cited as the tag team behind the renaissance of the camauro and ermine mozzetta, which were reportedly their early Christmas gifts to His Fluffiness. Ale and Gloria showed up together in Passau in October to sit alongside Msgr. Georg, the Pope's brother, for a symposium on the Ratzinger papacy and what it would mean for the church. La vera principessa's site is "placed under the protection of" the venerated Marian icon of the Salus Populi Romani -- which, conveniently enough, is located in the Chapel of S. Maria Maggiore funded and built by her family. And she's big on Lourdes, too. Speaking of Gloria e seguita, the latest on the Bavarian trip is that there remains an open chance that the Pope will get to stay with Bruder Georg at their home in Pentling -- unwinding with Chino, the cat next-door, and the porcelain kitties all over the place inside the house.